Almost ANY land exercise can be performed in the water, if creative enough! Aquatic therapy is combining the therapeutic properties of water with traditional therapy techniques to achieve a greater functional level in gross motor and/or fine motor skills. Aquatic therapy is a compliment to land based therapies and is part of a complete therapy program. We can start seeing children in the water as early as 6 months of age! 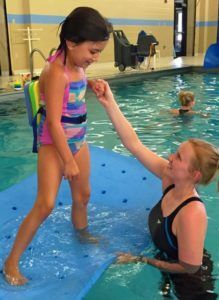 Speech therapy, occupational therapy and physical therapy can all be provided in the water!